Harmonizer for Wind MIDI Controller. Is there a better alternative to ewiVoicing? Is ewiVoicing really the best app in Audio category? Will ewiVoicing work good on macOS 10.13.4? 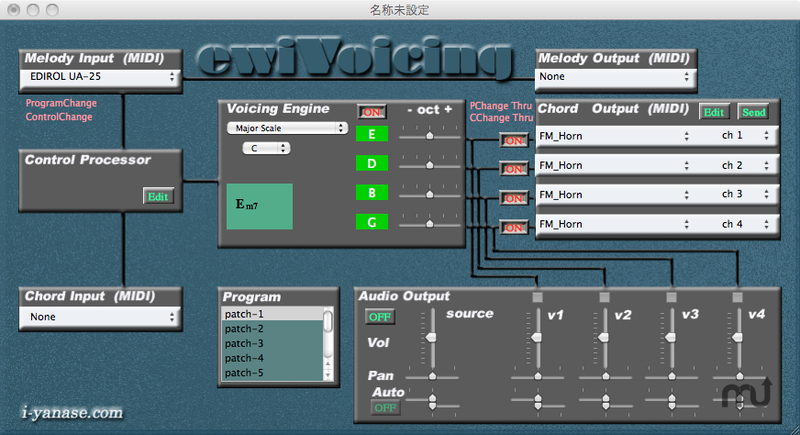 ewiVoicing is tool which does voicing of the output of Wind Midi Controller according to a given Chord.ewiVoicing analyzes the chord from single sound MIDI information from Wind Midi Controller or the chord MIDI information from keyboards. Scale voicing (like the Digitech DHP33) is available. ewiVoicing needs a review. Be the first to review this app and get the discussion started! ewiVoicing needs a rating. Be the first to rate this app and get the discussion started!